Yo, Yo! I am a bit giddy with the progress so far this week! I spent most of my day at our new house painting the basement walls, and I felt like a little part of a well-oiled Renovation Machine! The driveway must have had 6 or 7 trucks parked at one point. Several guys putting in the floor, a few more preparing closets for new doors, and another ripping out the upstairs carpeting. Jay (our builder) was around too. Lots of work being done and the house was happy to have so much attention! 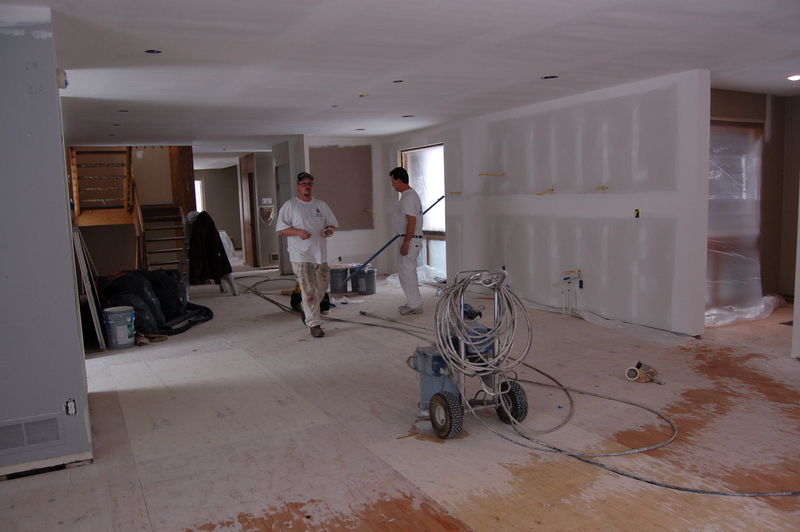 Monday, the painters sprayed and rolled the ceilings and primed the walls. Wow! So much better already! Before giving the ceiling and walls a makeover. Love the fresh paint, and the maple floor gets it start. Bowling anyone? Tom and Jason at work. This nail gun thing is LOUD…Ouch! (Tom usually has ear protection.) Thank Goodness, Jason gave me ear plugs. Floor Day #2 I love this second grade maple. Just the right amount of variation. So pretty in person! 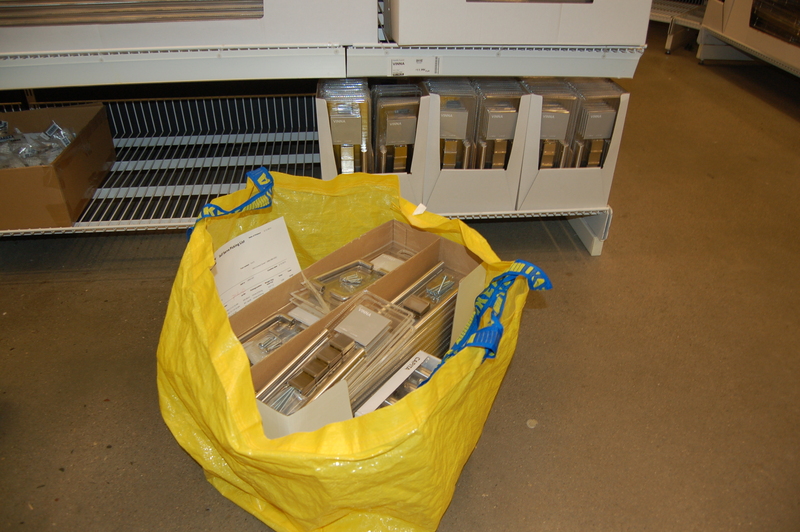 Yesterday, you could find me once again at Ikea in the kitchen planning department. We will be ready for the cabinets to be installed next week, so I wasn’t leaving without running the ole credit card and scheduling the delivery. Of course, 3 of my 6 horizontal uppers were not in stock. Someone had come earlier that morning and bought a big quantity of these, leaving just 3. I was there shortly after 11am, so I basically lost out by one hour. What luck! The good news is there are more coming in on Friday. The bad news is I will have to make a 5th trip back to the kitchen department to pay for these 3 uppers and pick them up myself, as there is no way to add them to the rest of my order scheduled for delivery on Sunday. I have learned that buying an ikea kitchen is not about fantastic customer service! Anyway, my card was swiped, and I feel satisfied that 98% of my cabinets will be delivered on site this weekend. Those floors are AMAZING! So much progress and it’s looking too good. Soon you’ll have magazine editors banging at your door. “can we come in”! Your home gets really great natural light… but the pot (recessed) lighting will be so beautiful in the evenings. Looks like you got the kitchen “in the bag”! Ha! I like your “in the bag” reference! I hope things continue to chug along without any major road blocks (that’s a bit obvious! 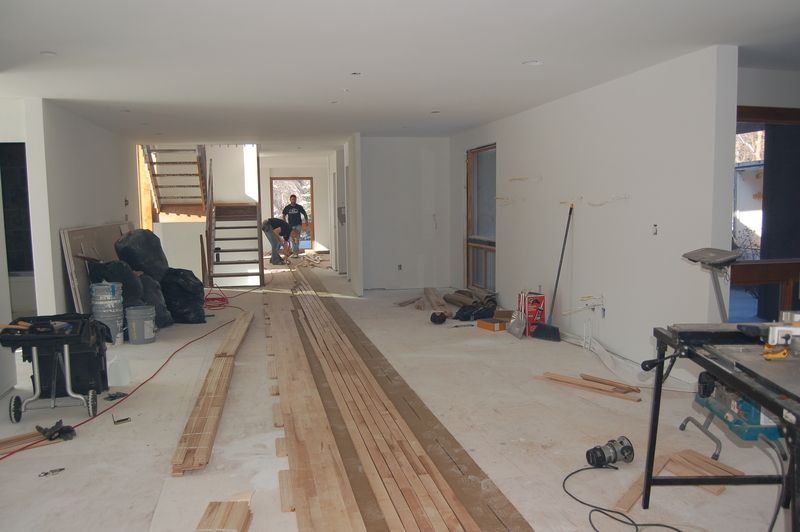 )… The house does feel much brighter with the light walls and floor. It was actually quite dark before, despite the large windows, and that issue drove many of the design decisions. Cross your fingers that we will have enough lighting for night. Trusting our architect on this one! Thanks for your comments!! Good choice on the flooring. 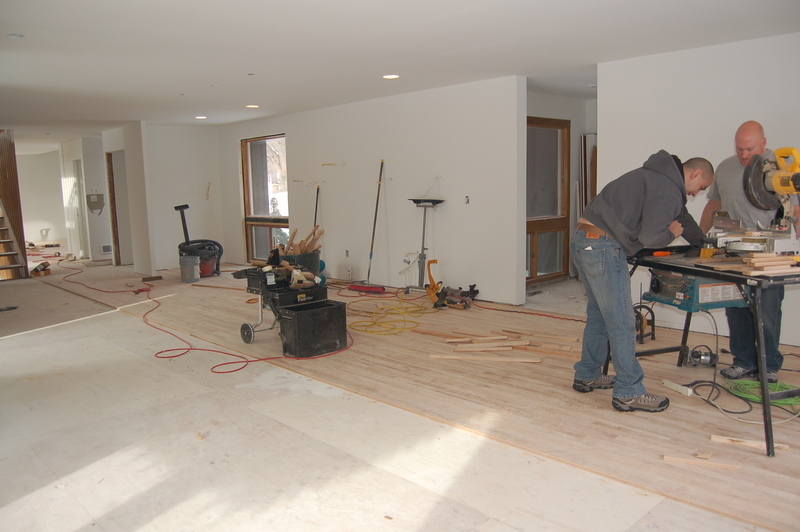 Glad to see you are using the “old fashion” 3/4″ thick rather than the new style 1/2″ engineered flooring. Good choice! Thanks for commenting, Dave! 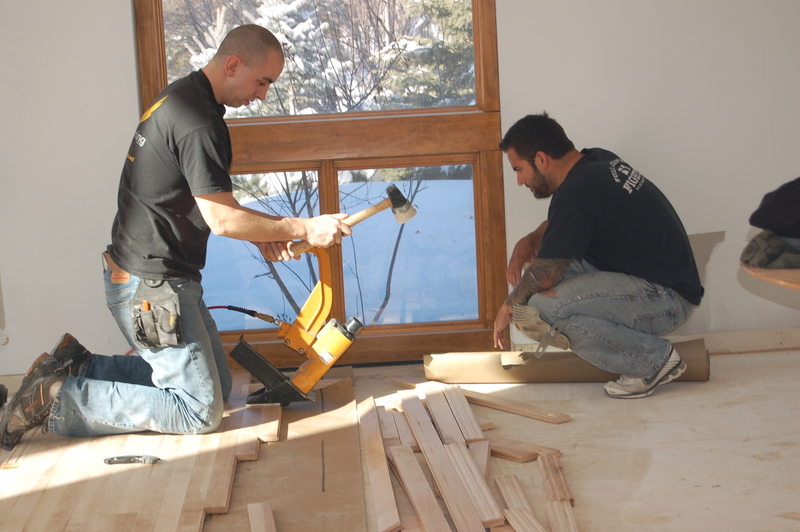 You and Penny are so kind to follow our house project, and I am happy you like our flooring. As of this morning, it’s almost all installed, and will be sanded this afternoon. It’s going to be the perfect canvas for everything else! Thanks, Mom! Can’t wait for you to see it in person! Just read a few posts. We need a new kitchen and i am contemplating IKEA. I am going to be really curious to see the finished project. Enjoyed your posts, I read a few. Hi Rebecca! Thanks for reading! Our Ikea kitchen is coming along, but there have been a few hiccups. Unfortunately, when there are issues with Ikea, it’s never an easy fix. I think they have a decent product for a good price, but the customer service is lacking, in my opinion. Also, I would only recommend it for someone living within a short drive to the store (we do), as there will be many trips made!